Area Rugs – What Size is the Right Size for Your Space? Area rugs can often be an afterthought, especially in rooms where carpet already exists. But to add a throw rug to a room adds another dimension of design. It can act as a focal point in the room, work to bring the room’s color scheme together, and help to define a gathering space…all while adding an additional level of comfort. 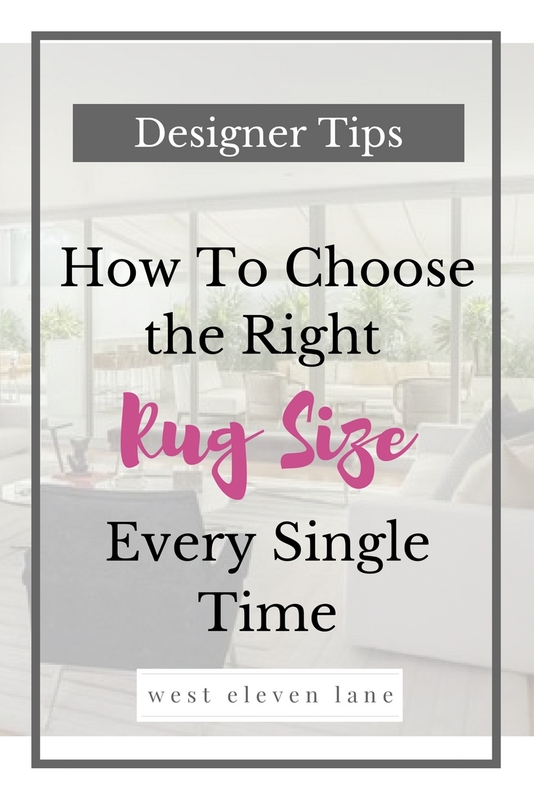 One of the biggest questions that comes up in my travels is, “What size rug should I purchase for my space?” because it isn’t always easy. I can raise both arms high in the air and state confidently that I have purchased the wrong size rug too many times. And I’m telling you, I never could put my finger on what was wrong with the room. I just always knew something was “off”. So to help you all avoid my same mistakes, I have broken down the appropriate size rugs based on a room’s function and size. Super simple! Dining Room – Your throw rug should be at least 24-30″ wider and longer than your table with the leaf in. Test and be sure that when your dining chairs are pushed out, the back legs will still be on the rug. You may want your guests to fall out of their chair from having such a good time, not because you’ve made the floor under their chair uneven. Living Room – Your rug should be at least as long as your sofa. Ideally, all furniture legs in your grouping should sit on the rug, but if it’s not possible, at least be sure that the front legs are on. If your room is on the larger side, use an additional rug to create a second seating area. Bedroom – This is going to depend on the size of your bed and night stands, but generally speaking, you’ll want for your rug to extend between 18-24″ out beyond each side of the bed. The purpose of the throw rug in this case is to ground your bed and night stands and create a grouping, while providing comfort underfoot. You should be able to climb out of bed without touching the floor underneath. Kids’ Rooms & Bathrooms – Simply add accent rugs for a pop of color and warmth. Foyer – An entryway rug should lead you into your home. This will help you to decide more easily on a rug shape. Round rugs work well near a circular staircase, or to make a foyer appear larger. They are typically not ideal in large spaces. Be sure that you leave 2-3′ of floor showing on either side, and check for clearance height under the door. Front Door – Match a rug size to the width of the outside of your door frame. Again in this case, you’ll want to check for door clearance. If budget is a concern or you’ve already purchased a rug that is on the smaller side, you can always layer an affordable solid color rug of the appropriate size underneath. Cheers to a more comfortable and cozy space! Where in your home could you use these tricks? Leave me a comment below. I would love to hear from you!